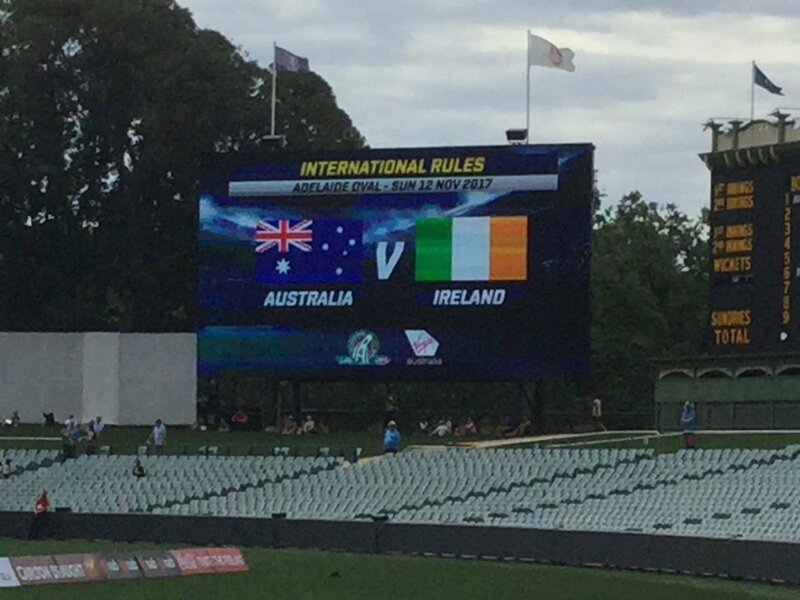 A solid group effort and a big second half lifted Australia to a 10-point victory over Ireland on Sunday afternoon at the Adelaide Oval. There were a lot of variables in play coming into the first 2017 International Rules test match -- the Aussie team hadn’t practiced formally up until the week of the match, the weather conditions weren’t in anyone’s favor, and the Irish team dealt with several players falling ill earlier in the week. A couple of late withdrawals for Australia -- primarily Toby Greene and Gary Ablett -- left a few question marks in the lineup. But, as it turned out, for many of the Aussies, it was just another day at the office -- albeit with a round ball. Team captain Shaun Burgoyne, Nat Fyfe, and Patrick Dangerfield showed off their skills and fought off the Irish onslaught in front of a crowd of 25,000-plus (25,502 official). After an impressive first quarter from the visitors, the Aussie side came alive and began to keep up with the fast pace of the game, dominating the disposals and clearances. Goalkeeper Brendan Goddard helped with his steady kick-ins, and also made two crucial saves to keep the Irish attack at bay. However, perhaps Australia’s biggest strength in the first test match was their ability to be patient and control the game clock. Players such as Zach Merrett, Kade Simpson, Jack Gunston, and others were able to slow down and speed up at will, resulting in silky smooth passages of play and some great clearances from halfback and the midfield. Combined with the quality pressure and tackling, this methodical approach wore down the Irish and the Aussies managed to hold on to a narrow halftime lead. Fyfe kicked Australia’s first goal early in the second half and added three overs, while forwards Ben Brown and Chad Wingard booted a combined four overs. But the pesky Irish wouldn’t go away quietly, buoyed by Michael Murphy (one goal, four overs) and Conor McManus (a game-high seven overs). Zach Tuohy managed to keep the Irish within striking distance with some quality clearances throughout the match, while Paul Geaney and Conor Sweeney booted one over apiece. McManus, a County Monaghan product, won best on ground for Ireland, while Fyfe earned it for the Aussie side. Ireland appeared to escape with a clean bill of health, but Australia wasn’t so lucky. After an outstanding first half, Scott Pendlebury left the ground with a hand or finger injury and did not return. Dayne Zorko had to have his hip iced in the fourth quarter, but it looked to be a minor niggle. The second IRS test match will be held on Saturday, Nov. 18th at Subiaco Oval in Perth at 4:45 PM local time. Great to have Rick cover this match from LA (and give a neutral view on the match). Thanks to Michael Robinson for the pic from Adelaide Oval we used to accompany this. It was good to see the game played without congestion. Yes there are less players, but it is on an smaller field so that kind of negates the less players factor. Enjoyed the contest which was pretty even throughout. No doubt the conditions suited the Aussies. I was glad to see the Aussie roll the dice and try to set up goal (or under) opportunities rather than just try to score more overs and behinds (wides?). I am not sure whether this was primarily due to the fact that you could not take possession of the ball on the ground? I am not sure if I am ready to see this in Aussie rules where players cannot contest for the ball no matter where it is, but maybe having to do it on your feet is the answer? Also having the threat of the opposition getting one out on a turnover and scoring 6 points seems to keep the defenders from pushing too far up the ground and congest the midfield when their team have possession. I also did not like the last touch out of bounds rule, which often penalises the player going for the ball (in a contest) or actually trying to keep the ball in play. Hoping we don't see this come into the AFL, but fear it is coming. Goddard did a great job as a proactive keeper for the Aussies, though couldn't match the experience and kicking power of Niall Morgan (and he took a pretty fair hanger too). After years of opposition to the last touch rule I think I'm on the verge of switching sides. All year there had been inconsistency but I thought it was just the odd decision here and there. But in the AFL grand final Richmond continuously took the ball out rather than cough it up to Adelaide which had set up defensively ready. It stopped Adelaide's goals-from-turnovers which was one of their strengths all year (it reminded me of the way Clarkson's Hawthorn kept the ball out of Geelong's hands in the 2008 grand final by continuously conceding behinds, leading to a rule change). It was the biggest factor in the upset result in my opinion - Adelaide should've been 4 or 5 goals up late in the 2nd quarter and it seems unlikely Richmond could have rallied from there, but by being close they and the crowd got on a roll when they got a sniff and of course when that happened they started playing great football, the crowd was going nuts and there was no holding back the tide. It has convinced me the umpires can't be relied on to adjudicate the rule fairly. Ironically after missing about 8 decisions against Richmond they penalised Adelaide one from one. It's actually how many rules end up being changed in the AFL. The umpires get them wrong so often that in the end the public accept that a radical change is better than staying with the current rule. If this had been a Victorian side on the negative side of a grand final loss like that I suspect the mainstream footy media (based in Melbourne) would've screamed and the AFL would've used that to bring in the change in 2018. Instead the media was more focused on celebrating the Richmond win and having cracks at Adelaide for not bringing their best, and their captain for not being gracious enough in defeat, and for being unhappy a key player was leaving his club. Yeah, still bitter about the whole experience. So yes, change the rules I say, the more that can be taken out of the umpires' hands the better. If we look at the history of the ball crossing the boundary then originally it was a bounce then the ball was thrown in. In 1925 a free kick was awarded against players kicking or forcing the ball out of bounds. In 1939 the free against kicking out was rescinded. In 1969 a free kick was awarded against players kicking out on the full because fans were tired of continuous boundary play. This law was ushered in with utmost uproar but quickly dissipated as unwarranted. In 2016 the SANFL trialled a law that a player would be penalized for kicking or handballing (disposing) the ball over the boundary. The feedback from that has been positive. I haven't been able to find out when but the fullback has been penalized for kicking the ball out (untouched) for as long as I can remember. 1. Reverting to an old law. 2. Reducing and simplifying the number of laws. 3. Removing most of the the need for and surrounding controversy of deliberate out-of-bounds. .
4. Encouraging play to revert to more attacking styles. 5. We aren't asking anything more of players than what the fullback is already required to do. As for the need for a player to be footed to pick up the ball I was shocked when this was first mentioned as it was a feature of Australian Football to show one's desire by diving on the ball. However, this feature has worked well in IRS to stop the number of scrimmages. As well we have seen diving on the ball discouraged in AFL immensely with strong holding-the-ball and tripping interpretations. From a skills p.o.v. , it is more skillful the way AFL players get a ball out of congestion these days. It doesn't have the same emotional desperation of diving on the ball but IMO we are just about at the point where we could flip especially from a safety and concussion perspective. Didn't really hear the commentators ever discussing/commenting about any of the decisions etc. when ball went out of play "last touch" or on the full etc. Seems like there were/are no contentious issues with it.